Last week my iPad arrived. It’s taken me some time to get it set up and figure out what apps are good for what and what I want to put on it, but today I really put it to the test, taking it with me to the PSEWeb conference. I had to find an app for note taking after I got there — in my cold-induced haze I didn’t think overly hard about that before I left this morning. Thankfully they had WiFi there so I could connect and download what I needed. You know I had to make myself a case for it. I had made one for Chris as well which he loves but I felt I could have done a better job. I guess the first time you do something is always a bit of a test run. However I hadn’t taken good notes about the width of binding I used on his and I made the binding too wide on mine at first. The stitching was inset too tightly for the iPad with the SmartCover on it, so I had to redo with a narrower binding (after I talked myself off the ledge that I didn’t need to redo the whole thing over again!). I wanted to try a rounded corner on mine because I didn’t like how the square corners of the flap on Chris’s stuck out. 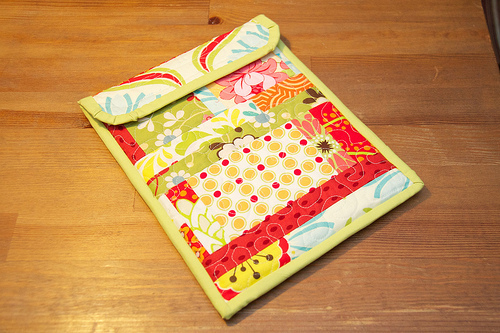 I’m not totally thrilled with how the binding looks on those rounded corners but for my first try, it will do. I need to watch a few more tutorials to get that figured out. It’s a pretty straightforward pattern, and maybe if I do a few more for other people and perfect it, I might decide to write it out and post it. 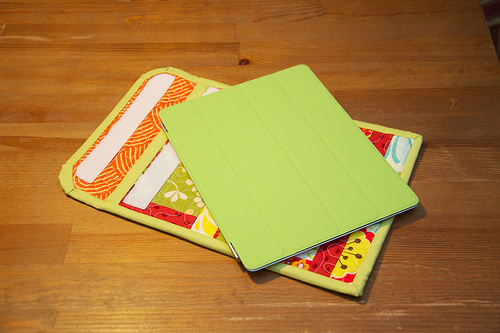 I noted that on Etsy there are many handmade iPad cases available, but none that I saw were quilted! 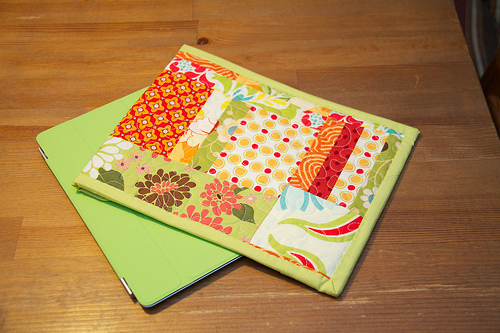 You could easily do this with random patchwork like I did, or just with a single piece of fabric that you love. Certainly quilting it gives it a nice extra padding for protection, and it just feels nice to carry around. As for the note taking at the conference — I am so done with paper! On Chris’s advice I used SoundNote — an app that lets you record audio and type (or hand write or draw with a stylus if you like) notes. I haven’t tried it with the audio yet, just used the typing functionality, but you can email yourself the notes and apparently also the audio if you want. I was recommending this app to my colleague Larissa before I had even tried it, thinking she would love that as an alternative to transcribing interviews. I’m also loving the magazine app Zinio, and I’ve even started reading a book with the Kindle app. I wasn’t sure at first how I’d like reading a book on the iPad but it was fine. And while sick in bed on Tuesday I watched some Netflix on it too. Flipboard is amazing for all your feeds — everything from Facebook and Twitter to Flickr and Google Reader. This thing is incredible. Even the mail and calendar apps are putting my poor old (and I stress old) iPhone to shame. I’m officially geeking out on this thing. It just may hold me until I can get an upgrade on my iPhone — if Rogers ever lets me (they keep expanding their equipment upgrade waiting period every time a new iPhone comes out). Phones will be tiny microchips embedded into your body before I’m ever eligible again for a free phone! The jury is still out on the best recipe app. I’m trying out Paprika but I was disappointed it came with absolutely nothing pre-programmed, and it took me a while to figure out how to capture recipes. It’s a lot like the Mac app Sous Chef, and I wasn’t thrilled with that app. I also bought the Epicurious app (of course!) which is fabulous, and also the President’s Choice app is so far pretty impressive. Both of these come with libraries of recipes, which is great to start out with. I’m guessing I’ll use all of the apps interchangeably, depending on what I need to do.